Oral hygiene is very important in children as poor oral hygiene may lead to poor health and other kind of dental diseases. The cavities and gum diseases not only affect the physical appearance of a person, but also lead to serious health problems such as insomnia, stroke and even hearing defects. It has been found from the studies that the poor oral care can contribute to the clogging of the arteries, problem of the lungs and even can damage the heart valves. This might be seen when an expectant woman having gum disease, makes a pre-mature deliver or the baby is very much in weight etc. Hence, it is very necessary to start a regular and good dental regime at the early age during childhood to avoid health problems and diseases at a later stage. For taking proper care of the teeth the child should be taught how to brush, clean and floss the teeth properly. To keep the oral health at its prime, the child should follow all the fundamental steps recommended by almost all the dentists. This avoids the incidence of dental problems like gingivitis, halitosis, tartar and gum diseases. Apart from proper brushing, the other hygienic methods like the right method of flossing and using the mouthwash have to be taught. The American Dental Association even advises the parents of a new born to start cleaning their newborn child’s mouth within few days after birth. It is very important for the clarity of speech and chewing action in the kids. Parents of young children schedule regular oral health checkups around the first birthday of the kid. A pediatric dentist should be ideal choice for children. The baby’s gums and teeth can be wiped with a wet washcloth after each meal to help removing plaque that gets accumulated on the gums and teeth. Soft bristle toothbrushes with pea sized fluoridated toothpaste can be used to brush the teeth. Also the children should be taught to spit the toothpaste at a very early age and until then the children should use toothpaste without fluorine. Till the kids are good and comfortable doing flossing and brushing, the parents should assist the children. The children should be fed with calcium rich foods and supplements along with a good oral hygiene to maintain good oral health of children. The children can be encouraged to brush by changing the color and appearance of toothpastes. 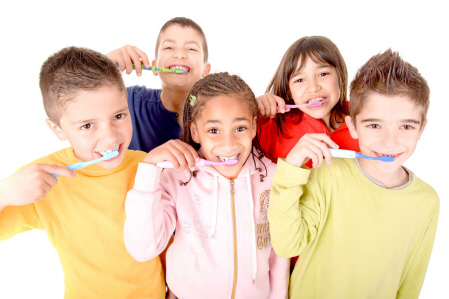 Most of the children do like to brush with a fluoride toothpaste but they should be able to spit after brushing. Also, the children need to brush twice a day. Eating snacks made of sugar and carbohydrates needs to be avoided if not at least the teeth should be brushed properly after eating them. It is a good idea to eat nutrition rich food like vegetable, fruits etc instead of sugar candies as they both provide the required nutrition and also strengthens the teeth due to the chewing action.